My dear friends I have not directly communicated with you since the closure of our wonderful adventures. Mostly because my energy field was sifting so fast that I was overwhelmed. The energy in the classes pushed my frequency into higher states than ever before, and I had to find a way to integrate it. Fortunately, I have love and lots of creativity in my life. Therefore my emotions are pretty centered which is a very good thing because my mind, my perceptions and my thoughts have been off the map. It is as if someone has turned the Light on in there and my cognitive, perceptive, conceptual and communication abilities have been vivid and speeding into higher and higher frequencies. There are so many different realities that are moving through our awareness just for a second year, a little word, a little sound in our voice, a brief glimmer on the side of our consciousness. All of these are happening within the One of the Now. And all of these I believe, I think, are possible realities. And, these possible realities are flirting with our mind because we are coming into the states of consciousness where we can inter-dimensionally travel. I can’t speak for others but my inner voice has been giving me orders. Actually it’s more like a choice than an order, but it has a sense of urgency in that order. I’ve always had a spirit being inside of me or my imagination, or both. I’ve always had this inner voice that was always talking to me. When I was young it was usually talking in terms of my past lives, which I have come to realize are actually parallel realities. And I would get elaborate pictures and stories which I have written in most of my books. I loved the way that we thought then. For the women that I was as a Hippie was greatly changed from the lady that I was raised to be. The sixties and the seventies were incredibly wonderful and quite dangerous. But all of the Hippies were pulled together to create a safe place and to have a lot of fun. Usually our higher perception enters our consciousness but our 3D brain can’t quite believe that it was real and that is why it’s so important that we work on expanding into higher states of consciousness. We have all had many lives in which we reveal our true self which we were punished and/or killed. So therefore we have this fourth-dimensional guardian that says – be careful, be careful. Remember back when this happened, remember back when that happened. We have to break through that. We have to break through that unknown fear that stops us as we begin to move into this new virgin territory. It’s virgin to us but it is alive and been in existence first for reality begins in the higher frequencies and then steps down to the lower frequencies. But we’ve been on this lower frequency for so many incarnations that we feel like we’re going to someplace new instead of consciously recognizing that we are actually returning to the place from which we have originated. 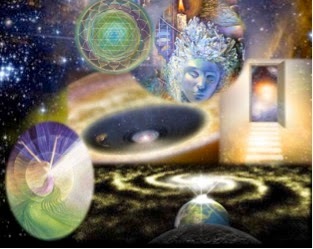 Fortunately, there are many changes that are occurring in our fourth-dimensional consciousness, in our aura, in that interface between our third-dimensional life and our fifth-dimensional life. And these changes are working unconsciously with our brain to slowly adapt us to the higher frequencies of perception. When we are on the third-dimension we are literally trained to deny the perceptions of our higher self. If we saw our higher self or spoke to our higher self we would be seen to be crazy, or we would be psychotic or there would be something wrong with us. That is old programming that protects us because of our other lives in which we came out as our self and the consequences were very dire. And these consequences left a scar within our consciousness and we need to move inside that scar and say, “it is all right now”. But we don’t’ really know that it’s all right because there is a threat of war here and a threat of war there. However the cabal is beginning to diminish. It has lost, and they are being taken out to another reality, likely the lower fourth-dimension, where energy out instantly becomes energy back. For they were resonating to such a low frequency that they would put out an energy field and by the time it came back to them they did not realize that that was a consequence of their behavior. So they did not learn. It is not as if they are being punished because punishment is not a component of a fifth-dimensional reality. If we put out a thought and place our emotions into that thought, then we create a thoughtform and that thoughtform comes into manifestation very quickly. That is why we have to be very careful about the thoughts that we couple with emotions. If we have a fearful thought, we need to Unconditionally Love and blaze it with the Violet Fire. Then replace that negative thought with a positive thought and connect that positive thought with Unconditional Love and with Violet Fire. In that manner, that positive thought will create a thoughtform of loving and safe transmutation. Those of us that have awakened, those of us who have dared to listen to our inner voice and follow the instructions that we feel within are the “code breakers.” We are breaking the code of brainwashing about who we should be and what we should do. We are breaking the code of the third dimensional indoctrination. As we break this code, as we find our courage so we can live the courage. and why we took this body. How true. I can confirm every word. - And what a great feeling of FREEDOM when listening and opening more and more to the recognition of our sovereignty. "Recognition of our Sovereignty" -- Great way to put it Nina. Thank you, Sue, I needed to read this today. Yesterday, for the first time, I saw through the 3D hologram and today I am sad that so many cannot do the same. So chaotic and overly busy, busy, busy, yet despondent, are people now. I can feel it and yet I can also feel the shifts that are upon us and that are coming. Thank you for today's article. You and the Arcturians, and Gaia, keep me going. Today, I don't know exactly where I'm 'going' and that's fine. I'll rest till Gaia tells me. Love to you and thank you again. This is the third message I come across since yesterday that talks litterally about the same thing. I get the we are NOW starting on our "new" playground where positive affirmations will work faster than ever before by looking inwards and truly create our lives without holding back.